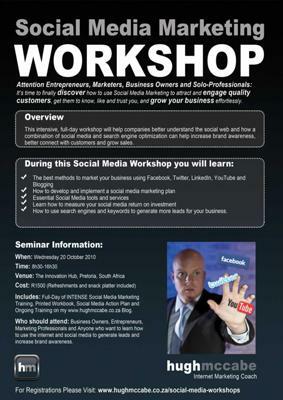 Discover how to use social media successfully in your business. This intensive, full-day workshop will help companies better understand how social media can help increase brand awareness, engage better with customers and grow sales. Along with strategy development and practical techniques, this workshop includes local case studies and guidance on a mix of social media marketing tools ranging from blogging to social networking to marketing with Facebook, LinkedIn, YouTube and Twitter. What do you get for attending this workshop? Only 25 seats available. Book early to avoid disappointment.